Everyone who visits the shop knows Ryan, he has worked at Perth Harley-Davidson® for 5 years, he started out as a Yard Hand and has worked his way up to be a Sales Person, and under the guidance of Tony, he is proving to be a gun in Sales. Ryan lives and breathes Harley-Davidson®, he is always the first in, last out and is at every event Perth Harley-Davidson® attends, to say he is dedicated is an understatement and while it sounds like all he does is work, in his spare time, he races any bike he can get his hands on and loves to race bikes and while he doesn’t ever plan it, always seems to break bikes too. Ryan has had a range of different bikes over the years, not always Harley-Davidson® and not always cruisers but his passion for bikes of every make and model is undeniable. He is currently riding a 2015 Amber Whiskey Road Glide Special and over the past couple of years, he has been racing it at the Drags at Perth Motorplex. 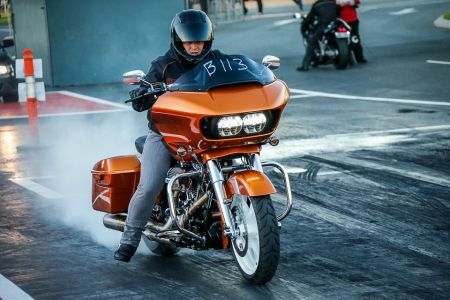 The Bagger is fitted with a Stage 5 Kit and Quick Shifter on Nitrous*, he is consistently running 11 seconds flat down the quarter mile and we think it could be getting up there as one of the fastest road-registered Baggers in Australia **. Ryan also races at the Dirt Drags. In 2016, he raced a Yamaha WR450 with a broken arm (thanks to racing dirt bike enduro’s - an example of how this happened is below), after having surgery, he’d just been cleared to work light duties, so he thought racing a dirt bike in a straight line was considered “light duties”. Unfortunately, he false started and didn’t manage to place. The following year, Ryan raced a XR1200 at the Dirt Drags, which was set up as a Dirt Dragger, and from that moment, he was hooked on the dirt drags! Ryan’s newest project is a Harley-Davidson® Iron 883, which he bought with a blown engine and is converting it in to a full-time Dirt Dragger. Keep your eye out for Ryan and his Road Glide Special at the Harley Night at the Perth Motorplex on the 13th December, where he is hoping to crack the 10 second bracket and be on the look-out for Ryan at the next Dirt Drag meet – with a bit of luck, he will have the 883 up and running. *Nitrous is only connected when racing at the Perth Motorplex under controlled conditions. **Do you have/know of a faster road-registered Bagger in Australia? We’d love to know the times it runs, so Ryan has a challenge!